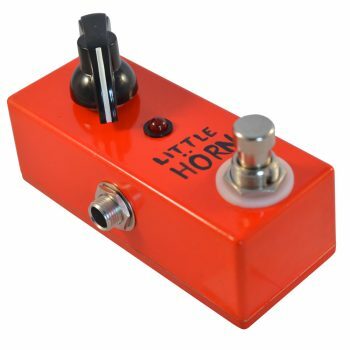 We thought a lot about improvements we could make to the Little Horn, and now we’re thrilled to present Little Horn v2.0: the exact same throaty, powerful clean boost, with two new features: advanced power filtering and a re-configuration which eliminates transistor bias crackle. Little Horn 1.0 was a fantastic piece of equipment, but could be a noisy little feller. So, we took the original circuit design and added advanced power filtering in v2.0, so not only is the boost itself hugely loud, but there’s almost no hiss or noise at all, even when pushed to the upper limits of its sinful boost capabilities. Even when heavily boosting an already distorted amp tone, Little Horn v2.0 is impressively noiseless. 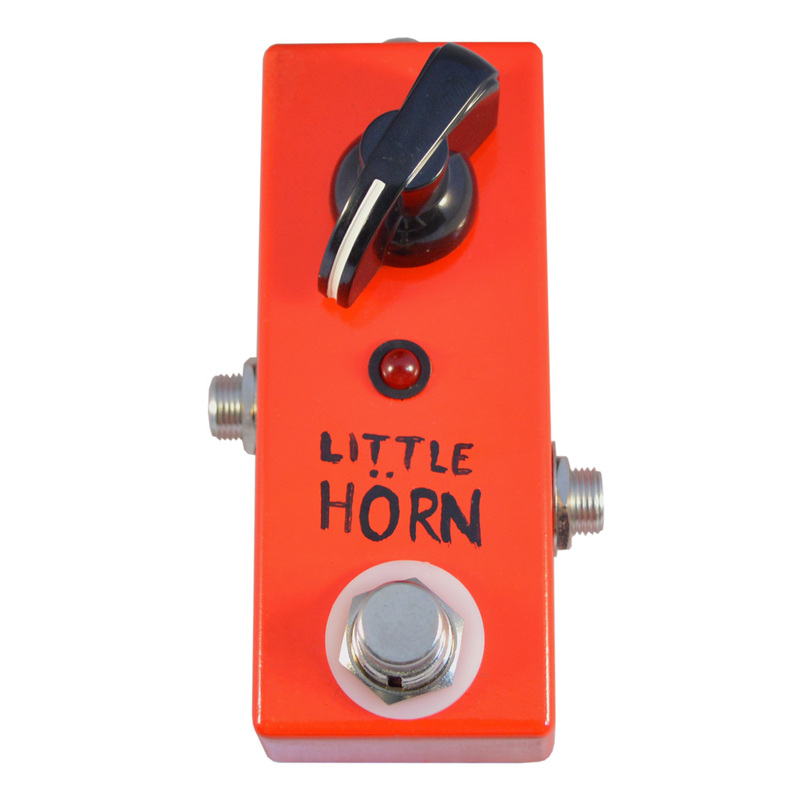 All of which makes Little Horn v2.0 an even more essential piece of pedal-based brilliance! We are a simple bunch here at Vein-Tap.com. We wanted to create a simple boost pedal, based on pure analogue circuitry, which would make us leave all our previous boost, overdrive and pre-amp pedals at home. 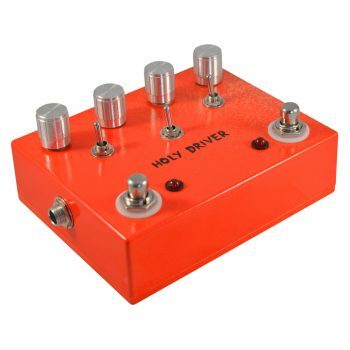 We needed something that can go all the way from a slight, subtle boost which adds just a little presence and transparent volume to a clean funk solo, to something which could stand up to the highest output metal stack – and make it scream louder and truer that you ever thought possible. All without unnecessary bells and whistles; tone, body and frequency controls aren’t welcome here, simply because they’re not needed. Pure, clean, transparent but powerful boost – that’s the name of the game here. Some boost units advertise themselves as powerful, but can leave you wanting more. We, however, knew that we couldn’t let the Vein-Tap.com name down by creating less than the biggest and boldest bully in the playground. There’s volume here in spades, and if you’re the kind of guitarist who needs to use the Little Horn at 11 – well, let’s just say, we hope no one ever challenges you to a drinking contest. 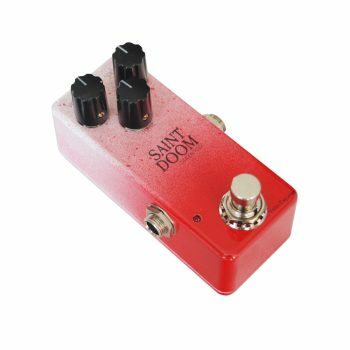 Or, if all you want is a little bit of subtle oomph, you can use the Little Horn in it’s lower controls to gently push an amp to slightly higher volumes in a warm, transparent and pleasant way. It’s up to you. There’s no use in an inflexible boost unit – so we created our Little Horn to cater for guitarists of all styles, genres and tastes. 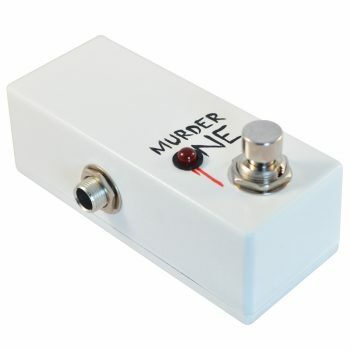 Putting this pedal in your effects loop is just as exciting as putting it in front of an amp. In the pre-amp position, you can push your amp to working harder, sounding louder, thicker, and mightier. Putting in in the effects loop, however, literally takes your existing tone and makes it louder. If you want the exact same sound, just louder, stick it in your effects loop. If you want your existing tone, but fuller, meatier and more impressive, stick in before your amp. Experiment with either – or, get two, and get the advantages of both! A boost as powerful as the Little Horn would still be no good at all if, when switched off, it still affected your signal. That’s why the Little Horn is wired with True Bypass circuitry, to prevent this happening. When it’s on, you get a stimulating boost – but when it’s off, it’s like it isn’t even there. 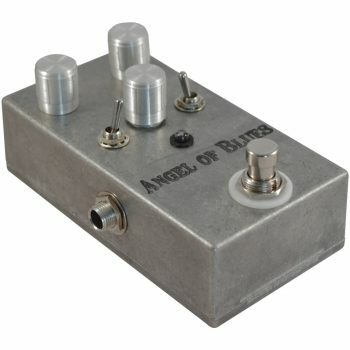 Please remember that this pedal, in its upper control settings, can be a brute. 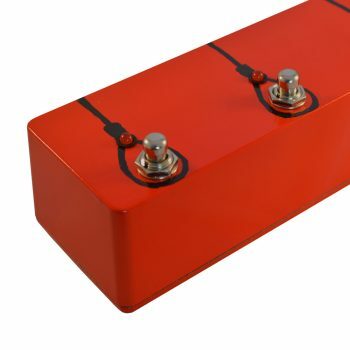 While it’s completely safe to use with all amps, it can kick out far more volume than you might expect, so make sure to turn the boost control all the way down to 0 when you first try it out. If not for your sake, then for your neighbours’. If you’re looking to bring back the spark into a guitar which, through age, has lost its original appeal, pop a Little Horn in between it and your amp. Similarly, if you’ve noticed that your long guitar lead robs your tone’s pleasant high end sparkle, bang a Little Horn as the first pedal in your chain. You’ll notice a new sense of openness and clarity. This is because the Little Horn’s input impedance is crazy high – over 5M? – it bounces all current from the pickups right back at them. 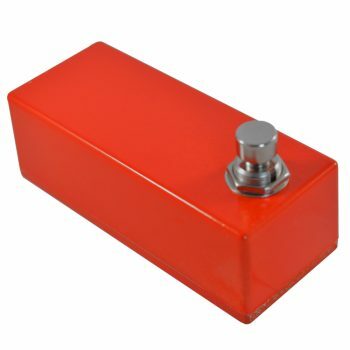 This keeps the magnetic field where it should be, and brings your pickups right back to life. 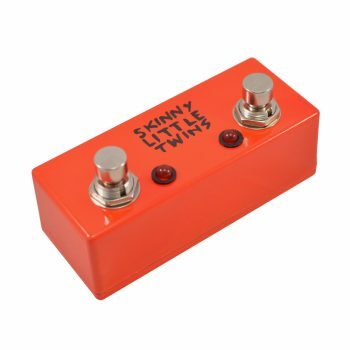 Remember that the Little Horn, though mighty, isn’t a Distortion or Overdrive unit, and it won’t turn a clean Fender amp tone into a Mesa stack. What it will do is bring a new, fresh, overwhelmingly beautiful boost to your amp’s existing tone, making it do exactly what it already does – just much, much better. 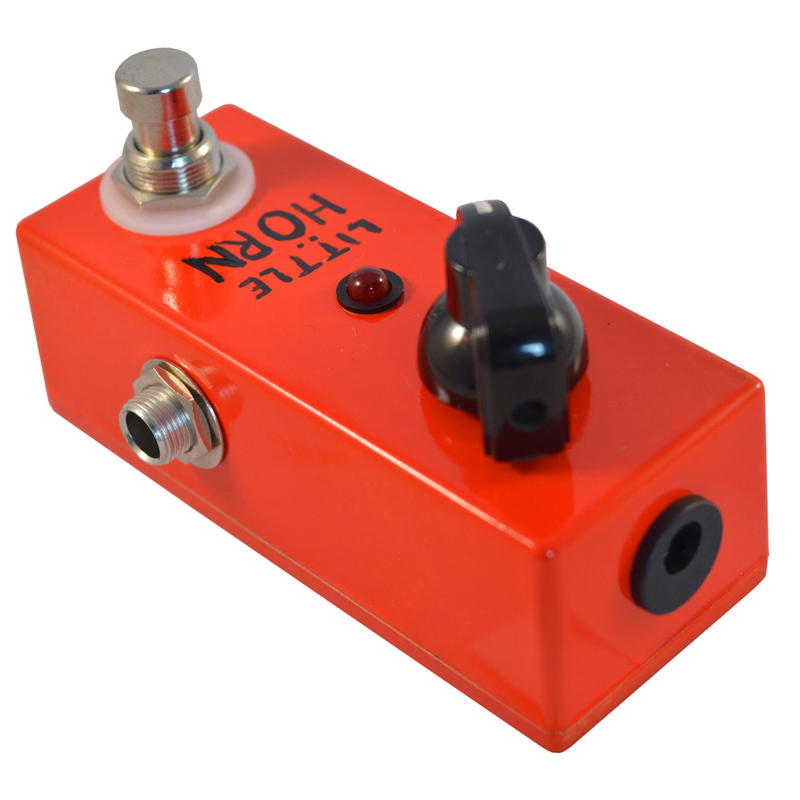 Buy a Little Horn Guitar Boost Pedal today! It makes more sense than your drummer’s medication! 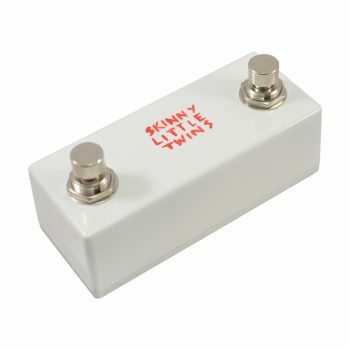 Nice compact little pedal. Clean boost and a little sparkle. Always on.